The captivating, inside story of the woman who helmed the Washington Post during one of the most turbulent periods in the history of American media. In this bestselling and widely acclaimed memoir, Katharine Graham, the woman who piloted the Washington Post through the scandals of the Pentagon Papers and Watergate, tells her story—one that is extraordinary both for the events it encompasses and for the courage, candor, and dignity of its telling. Here is the awkward child who grew up amid material wealth and emotional isolation; the young bride who watched her brilliant, charismatic husband—a confidant to John F. Kennedy and Lyndon Johnson—plunge into the mental illness that would culminate in his suicide. And here is the widow who shook off her grief and insecurity to take on a president and a pressman’s union as she entered the profane boys’ club of the newspaper business. 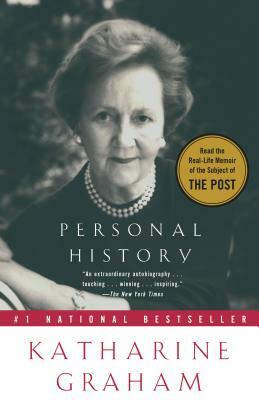 As timely now as ever, Personal History is an exemplary record of our history and of the woman who played such a shaping role within them, discovering her own strength and sense of self as she confronted—and mastered—the personal and professional crises of her fascinating life. Katharine Graham is fondly remembered as the powerful, longtime publisher of the Washington Post. She died in 2001.